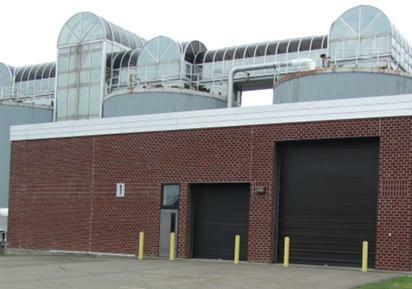 The Binghamton – Johnson City Joint Sewage Treatment Plant (BJCJSTP) is a 35 million gallon per day (MGD) wastewater treatment facility that is jointly owned by the City of Binghamton and the Village of Johnson City and managed by the Binghamton – Johnson City Joint Sewage Board (BJCJSB). CAMCE performed structural design under a subconsultant agreement to a prime consultant for the BJCJSTP Restoration and Rehabilitation project, which entailed modification of an existing structure to a new Maintenance and Administration Office Building. CAMCE provided the final design for structural components, including reinforced concrete block/brick cavity walls, structural frame including steel joists/metal deck, elevator shaft and 2 stair towers and modifications to existing cavity wall/ concrete basement area. The new upper level design included 9,500 SF of new office and administration building, a new 1,300 SF vehicle storage, and rehabilitating the existing 12,530 SF basement level. CAMCE also assisted the prime in construction administration services during the construction phase. CAMCE was commissioned under a subconsultant agreement to a prime consultant, on behalf of the New York City Transit Authority to perform structural analysis and design of the primary structure of the building at the new Arthur Kill Station on the Staten Island railway system. This included the design of structural steel and concrete slabs for the first and second floors and roof including supporting steel columns and the concrete, structural steel and metal deck. CAMCE also liaised with the New York City Transit Authority to satisfy the Authority’s Engineer’s comments with regard to the structural detail of the design, referring to the anchor bolt layout, typical beam to HSS Moment Connection and steel framing connections. Furthermore, CAMCE performed calculations and drawings for the light gage roof truss framing system for the new building as well as redesign of the building structural framing and floor slabs.The structural designs were in accordance with Specification Section 05 Structural Steel (AISC) as well the 2010 Building Code of New York State. CAMCE was commissioned by the Town of Mount Pleasant to perform the structural design, permitting, construction administration and field services for overlaying the sloped timber trussed roof over a new existing Flat roof which has developed leaks due to its age. The existing Highway Garage has a foot print of 20,200 SF. The structure is a steel frame structure with 12-inch concrete masonry block walls. The current flat roof is comprised of 2-inch concrete block overlaid by 5 ply flat built-up roofing. It is supported on approximately 39’ long 24LH10 bar joists spaced 4 feet on centers. The joists are supported by wide flange steel beams resting on steel columns. 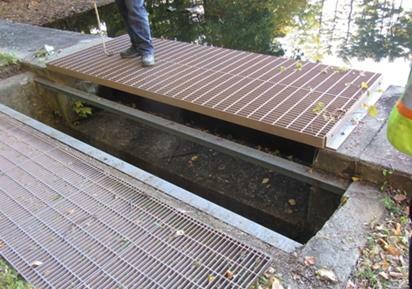 In order to comply with the NYSDEC guidelines regarding Class B Hazard Dams, CAMCE was commissioned by the Town of Mount Pleasant to perform the design, construction administration/management and field services for modifications of the Town of Mount Pleasant Water District Dams No. 1, 2, 3, and Ferguson Lake Dams.Phase I included structural modificationsto spillway of Lake #3, which involved drawing down of the water from the lake for construction purposes and removal of the existing spill way wall and construction of a new concrete structure with 46 linear feet of concrete spill way, in order to pass 150% of the design flood. In addition, CAMCE designed for the replacement of two 18-inch diameter outlet pipes downstream of Lake #3 with five 24-inch diameter reinforced concrete pipes. Under the management and construction administration services contract for the project - Rehabilitation of the Main Intercepting Sewer and Various Manholes, CAMCE was commissioned by the Passaic Valley Sewerage Commissioners to design a line stop restraint on a 42-inch water main. The said 42-inch PCCP water main, owned and operated by the Passaic Valley Water Commission (PVWC) is located directly above the lining pit and had to be offset to provide workspace for construction. 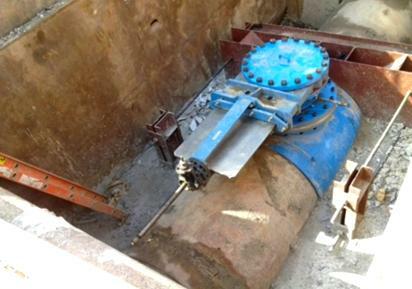 The 42-inch x 24-inch folding head line-stop would be used for temporarily bypassing the flow until the new water main extension was commissioned. Due to the large scale of the required restraint, along with the tough field conditions, the owner of the water main required a bespoke restraint design, which would resist the tremendous axial thrust on the line-stop that would need to be resisted during the flow bypassing. The line-stop restraint included a restraint sleeve positioned immediately downstream of the line stop. The restraint was threaded back C-section anchors which were supported by an assembly of H-beams encased in a reinforced concrete thrust block. The concrete thrust block extended from 5 feet below the pipe to the center of pipe, which would allow for any future access to the water main by its owners/operators. CAMCE was commissioned to conduct special inspections during the constructionof thenew ViB V Hotel, an eight-story hotel with an approximate area of 35,000 SF with 78 rooms in downtown New Rochelle, New York, in order to meet the International Building Code standards. This includes inspection of steel, concrete, masonry and wood construction; soils; driven deep foundations; cast-in-place deep foundations; helical pile foundations; fabricated items; exterior insulation and finish systems (EIFs);and fire-resistant penetrations and joints. The inspections also include special inspections for wind and seismic resistance as well as smoke control. The project upon its completion will seek LEED NC 2009 Silver Certification. 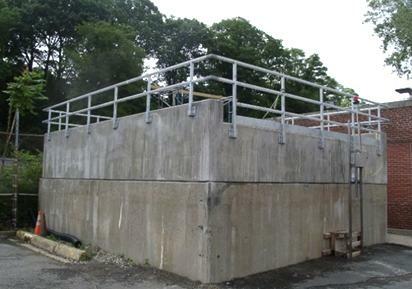 The South Control Structure at the Yonkers Joint Water Resource Recovery Facility (YJWRRF) receives flow from South Yonkers and the neighboring CSO facility as well as the flow from North Yonkers via the North Control Structure – located upstream. From there, the consolidated flow moves through the control structure and on to the Plant’s screening facility. In an effort to increase the storage volume within the South Control Structure and decrease the frequency of overflow, the County wished to raise the top of the concrete structure to closely match that of the North Control Structure. The modification would result in raising the top elevation by a maximum of 3-ft, and a storage capacity increase of approximately 6,900 gallons. CAMCE was commissioned to provide the design of the modifications to the South Control Structure as well as temporary installation plans for re-routing and moving of equipment.